Welsh Open 2012: Ding Junhui beaten Mark Selby by 9-6 to crown in Newport, winning his fifth ranking title after 26 months of waiting. The final started with a century from Selby, 103 before Ding levels with 64 in the next. Selby looked to enjoy a fine start, knocking another century 124 to regain the lead. The crucial moment came in the frame 4 that Selby missed the leading position at the interval. That turned the match upside down and ended up to be Ding leading 5-3 after the first session. Selby missed a thin cut on the green but Ding needed the pink to take the frame, Ding missed a difficult pink with rest to let Selby back in. The Leicester man potted the pink but missed the final black with cueball near the cushion. He left Ding a difficult thin black to the left bottom corner and he gripped the chance. Selby played better but he had no advantage at the interval, 2-2. 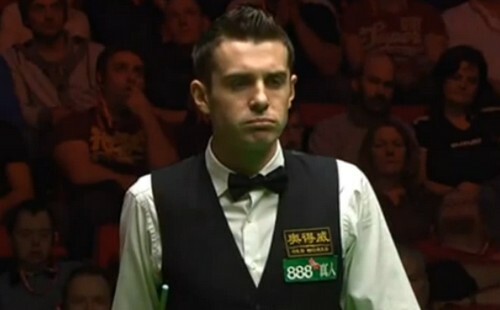 The Chinese nicked the next two frames with 90 to lead 4-2 before Selby pulled one back with 66. The Jester from Leicester blew it to make 4-4 as he missed a tough blue on 19, Ding's 51 helped him to secure a 5-3 lead before the night session. 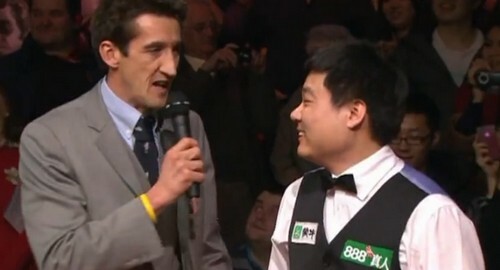 Selby won the opener of the night with 73 then Ding was back in with 83 to lead 6-4. Selby once again narrowed the gap to 5-6 with 91 hoping to level 6-6 at the interval but 'Enter the Dragon' kept calm and made his first century in the tournament, 124 to regain the two-cushion lead at the interval. He hit back-to-back tons 130 to reach the match point but Selby replied with a 145 total clearance, the highest break of the tournament. 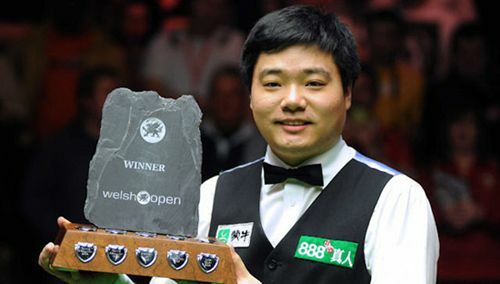 The final ended in a scrappy frame 15 with both players had chances but 42 of Ding helped him to conclude the match and tournament, earning him the Welsh Open 2012 title. "It feels great," said Ding after the match. "I was nervous during the final and missed a few chances. Mark kept the pressure on me and it was a hard game. In practice I have been feeling good and playing like I was a few years ago.'' "I didn't have a good start to the season and coming here I felt I could lose in the first round. Now I will try to do well in every tournament." The Chinese thanked his girlfriend for all her support, "Apple has helped a lot because she looks after me, cooks for me and gives me time to practise every day. It's much better for me than before. I bought the house in Sheffield two days ago, I have just got the keys. I will put a snooker table in the garage so I can play on my own if I am not going to the Academy. I can park the car outside, the table is more important!" The runner-up as well as the World Number One said: "The frame I lost to go 2-2 rather than 3-1 up was probably the turning point, even if it didn't seem like it at the time. I had my fair share of chances in the match and you can't afford to miss them against a player of Ding's class. He's one of the best break-builders. I'm taking the positives out of the week because I've turned my form around and with more hard work hopefully I can win another title this season."